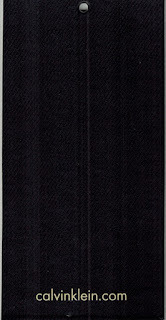 Today we have a special entry, the 2015 update of our 2013 Third Runner-Up award winner, the Calvin Klein Jeans hang tag. In that version, I praised the clean design and the smart implementation of a long, narrow hang tag that would display nicely. 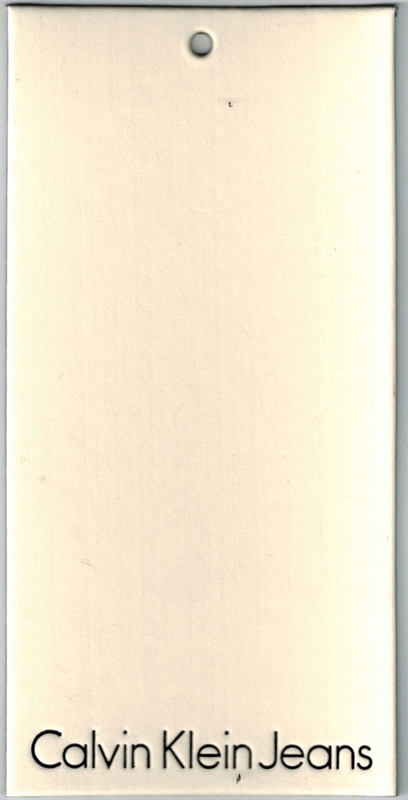 I also commented on the thick card stock used in the production of the tag. This year's version makes some updates while carrying forward the tradition of quality materials. The front has been changed from white to a cream, which looks and feels expensive. There is definite heft in your hands, and the stamped "Calvin Klein Jeans" at the bottom give it visual depth. You can run your fingers over the lettering and feel the depth. 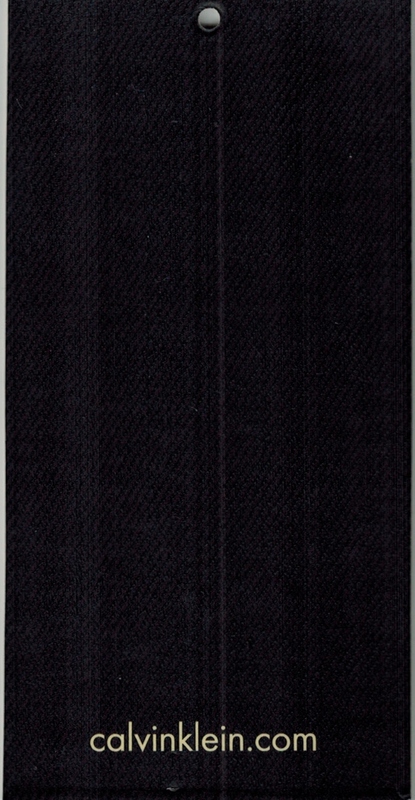 The size has changed, this now resembles a standard rectangular hang tag. The reverse has changed dramatically, whereas previously Calvin Klein brands were a single white card, the reverse now has textured black paperboard. Initially I thought it may be some sort of the faux carbon fiber that is wildly popular, but upon closer inspection it actually appears to be a denim fabric pattern. A great touch for a denim product, and like the front, you can run your fingers over it and feel the texture. 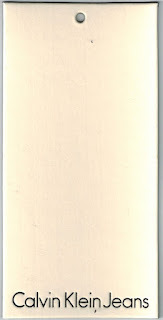 The reverse has the name.com web address, unfortunately just flat printed, in the same cream color as the front. Interestingly, they have dropped the unique top level domain name, which is helpful for simplicity but also makes the printing here unnecessary. This is another impeccable entry from Calvin Klein, which is quickly becoming my favorite brand for hang tags (I liked a Calvin Klein Dresses Hang Tag too). It all starts with the quality materials, this tag has heft and feels good in your hands, and screams class and luxury. Both sides have textures that you can see and feel, rarely does a label get such weight and depth. The design continues to impress as well. There is straightforward simplicity here. Hang tags without text appear to let the product do the talking, and that is the effect here. I'm especially impressed that each side has such variation in texture and color, and yet both are clearly from the same product. I praised the 2013 Calvin Klein Jeans Hang Tag for being designed to look good from any angle, and I think the same applies here. No matter which side is facing forward, it looks good. I'm still not a fan of the name.com, and I'm even less of a fan of the wishy-washy changing of top level domain names. A special landing page for your denim is fine if you directly link to it, but otherwise useless and outdated, like flash intros.